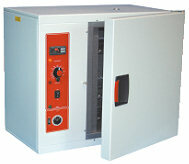 The Genlab range of Hot Air Sterilisers are manufactured to conform with the strict requirements of hot air sterilisation in laboratories and hospitals. The exterior is constructed from sheet steel finished in an easy clean powder coated paint. The interior chamber is made from hospital grade stainless steel. Fitted with fixed shelf runners and removable chrome plated wire grid shelves. The top vent is fitted with a clip to hold a mercury-in-glass thermometer. Heated by Incoloy sheathed elements positioned around the fan. The basic control system comprises of a direct reading thermostat and overheat thermostat both with calibrated scales and tamper proof locks. They also include main switch with indicator and heat and overheat indicators. Timing is via a simple 120 minute mechanical run back timer. The digital system comprises a PID microprocessor digital controller with dual display of both temperature and set point and a separate digital timer that is programmed for automatic run back at temperature. As an option the units can be fitted with an audible alarm that signals when the process is complete and for additional safety a door lock is available. All units 250 litre capacity and above have the digital controls system as standard. All units 500 litre capacity and above have the door lock as standard. The models in this range are the HAS/50/SS, HAS/75/SS, HAS/100/SS, HAS/125/SS, HAS/150/SS, HAS/200/SS, HAS/250/SS/DIG, HAS/350/SS/DIG, HAS/425/SS/DIG, HAS/500/SS/DIG, HAS/650/SS/DIG, HAS/750/SS/DIG, HAS/850/SS/DIG and HAS/1000/SS/DIG. All units have stainless steel interior and fan circulation as standard. For controller options on units up to 250 litres simply add the option code to the original reference.